At 10 X 6 there is no denying that the gorgeous, Ickworth Summerhouse would be a stand out feature in any garden! Crane made the brave decision to take a different approach with this line of sheds and summerhouses. Rather than do what everyone else is doing they decided to research those old British style summerhouses and sheds that were all across the East Anglian landscape many years ago. The result is………… jaw dropping! Very few summerhouses have as striking a first impression as this one does! 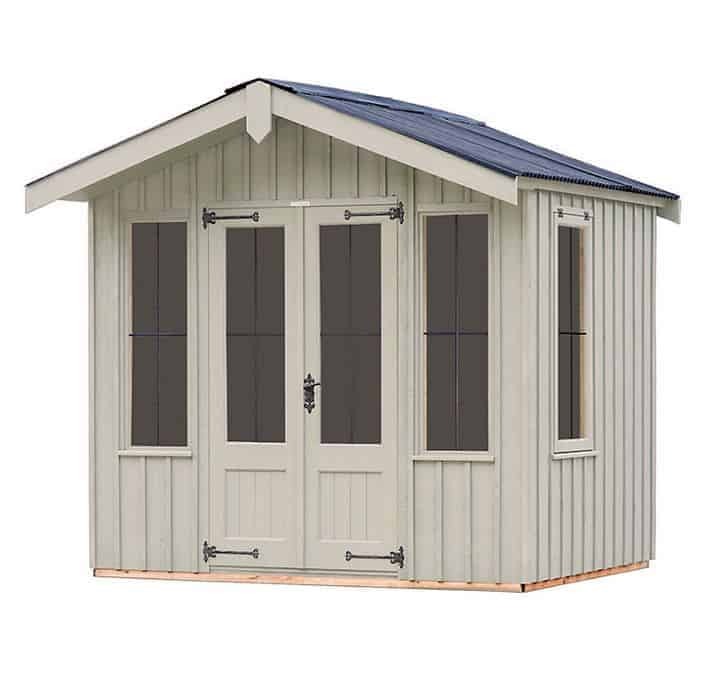 It has these huge double doors that are just whispering to you “come inside and relax” You have an apex style corrugated roof to really give it that old school, British look. And of course you have just absolutely top of the line craftsmanship. 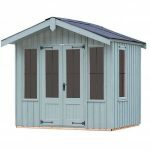 In all this is a summerhouse that really captures you attention and makes you imagination run wild with what you can do with it the second you look at it! It is on the expensive side! 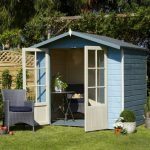 When a summerhouse has such an epic first impression like this one does we know first-hand it can be so tempting to just rush in and start hitting the buy button like a maniac, but before you do that check out our more in depth review down below. Right here we have the mid-range version of the Ickworth Summerhouse and it is in a very nice size of 9 feet 8 inches of length and 5 feet 9 inches in width. 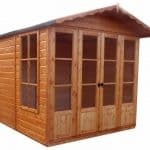 It offers you a very interesting shape inside the summerhouse which does give you a lot of possibilities when it comes to designing it. As most of the size of the summerhouse is in its length this does give for a fun challenge (although challenge might be a bit harsh of a word) in figuring out how to make the very best, but with nearly 10 feet we are pretty confident that you will be able to plan this out anyway you want! The height of the summerhouse right at the ridge is close to seven feet tall and the eave is at about the six foot mark so there will be no hunching over while you are inside. The roof of the Ickworth Summerhouse is something that we really do love and is perhaps the main thing about this summerhouse that gives it that classic, East Anglian feel. Rather than use roofing felt, Crane have used corrugated roof sheeting and it just looks great. The apex design of the roof as well as looking good is also practical in keeping the rain away. Holding up this excellent roof are some 19 x 125 mm tongue and groove boards. The biggest surprise for us was that inside the summerhouse there is an actual ceiling. This is rather unusual and it certainly does add more personality and class. The ceiling is made from pine tongue and groove boards and it looks so nice and is rather understated that after a while you sort of take for granted that it is there. When it comes to cladding if you are in the know, then you know….. you know? By that we mean that cladding on a summerhouse is vitally important to not only making the summerhouse look nice, but also making sure it is still standing after many years. 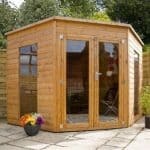 To many people who are looking to buy their first summerhouse or shed do not realise the importance of high quality cladding. The cladding that is used on the Ickworth Summerhouse is sawn board cladding which is deliberate choice by Crane in order to give it that old school look. Scandinavian Redwood is what this cladding is made from and believe us when we say this wood is so strong that it could take on Mike Tyson! The cladding is 12 x 150 mm thick and it has a topping that is 16 x 38 mm to give it a little extra protection, but also give it a very nice effect. At 39 x 50 mm thick and once again made from Scandinavian Redwood like the cladding is (and pretty much everything else on this summerhouse!) the frame is going to be solid and last for many years. We know that after a few years a frame can start to lose a little bit of its muscle and your once Hercules of a summerhouse starts to feel weak and not quite as sturdy as it once did. This framing is not messing around and will be as strong as the day it was made for many years. We feel that this framing along with the cladding does ensure that you have one heck of a tough (but great looking) summerhouse. The flooring of a summerhouse is very important as you will probably have quite a bit of stuff in here things like chairs, a table, some shelving…….. and if you really want to go all out some kind of mini wine fridge! The boards that are used for the floor are 19 x 125 mm tongue and groove board, the same ones that are used for the roof. These are good and solid boards which have some 38 x 50 mm floor joists which are made with that awesome, Scandinavian Redwood to make sure your floor is solid. This is a summerhouse that is going to be standing for many years. Due to the craftsmanship and the excellent materials that are used all throughout the summerhouse we are sure it will last you a lot of years and give you no trouble…… but of course there is always that one person who is unlucky! But thankfully, Crane do have a very good two year warranty which will cover you in case there is any kind of issue that happens with your summerhouse as a result of general wear and tear. 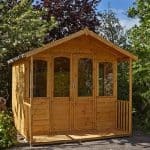 Crane will come to your property and carry out any repairs or replacements to make sure you can get back to enjoying your summerhouse as soon as possible. Accidental damage is not covered so keep the wrestling in there down to a bare minimum. It was the doors that we noticed first when we saw the Ickworth Summerhouse. These double doors have a width of 1830 mm which is more than wide enough to get a chair, table or a set of DJ decks….. if you plan on having some wild raves in here! The height of the doors is 1100 mm and this offers an ideal amount of head room to get in and out of the summerhouse without knocking yourself out! The doors are attached to the summerhouse with these, Fleur-de-Leys hinges which are strong, but they also look very nice. The doors have a large window on them which is made from 4 mm glass and to just add that little bit extra class have a lead cross effect. There are a lot of windows on this summerhouse! Including those two on the doors there is a pretty spectacular six windows! The two on the doors are joined along with another two on the front of the summerhouse. These are done in the same style, made from that same glass and also have the lead cross effect, but they are a little bit bigger. On each side of the summerhouse there is another window which is the same, but these ones actually open and do so with these really nice black hinges that fit in with the other black details on the summerhouse. Crane are making sure that your belongings are going to be kept safe by having a mortice lock on the door (which looks very classy by the way!) this with a solid door handle make sure that when you close this summerhouse up for the night that it will be secure. We feel that the windows are such a standout feature of this summerhouse, but some people do like their privacy and we get that. While we think it would be a bit of a shame to cover up these windows, some nice blinds can work very well. 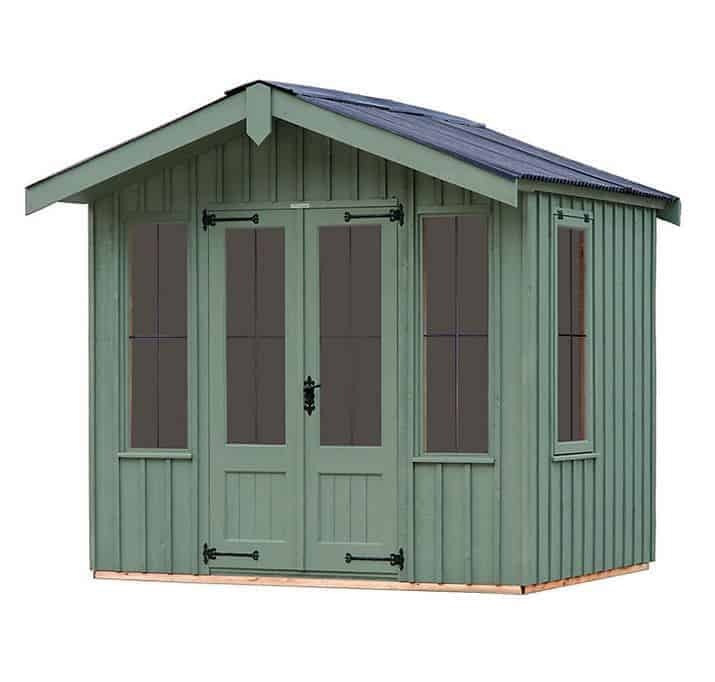 To make it so this summerhouse will fit in with any style of garden, Crane have six pretty diverse colours for you folks to pick from. The colours that you have to pick from range from the more understated type colours like Wades Lantern to colours that are a little bit more “on the nose” like Terrace Green. The available colours are, Painters Grey, Earls Grey, Dome Ochre, Disraeli Green and the two aforementioned Wades Lantern and Terrace Green. The Ickworth Summerhouse is just top quality all the way. There is not one single part of this summerhouse where we feel, Crane have cut corners. 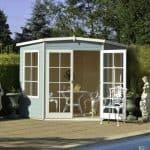 It may have a high price, but you really are getting a summerhouse made from the very highest quality. We have no concerns at all about the Scandinavian Redwood that is being used . As the very best of materials are what is used, you will have a summerhouse here that is going to be a feature in your garden for many years. Having ten feet of length to make use of is no small feat! Add to this another six feet of width and we feel that the only limitations you have when laying out this summerhouse are caused by your imagination! 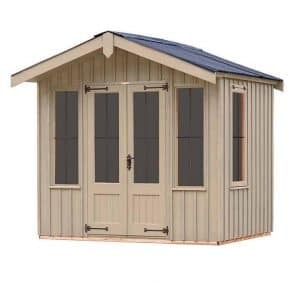 10 x 6 is a very nice amount of space and we are sure that many people are going to have a really good time setting up this summerhouse. You have no concerns over the summerhouse falling down because you did something wrong, hitting your thumb with a hammer or standing on a nail! This is because, Crane as well as delivering the summerhouse will build it for you! We know that £5,099.00 is certainly no small chunk of change, but this summerhouse is made with amazing materials, has a fantastic design and it does have some nice storage space as well. 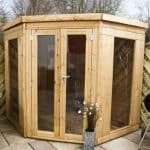 So while the price is high we do feel that the quality of the summerhouse does make the price worthwhile. Final Thoughts: At a little under five grand, you may think that we would have a really hard time justifying anyone (bar the super-rich of course!) to buy this summerhouse. 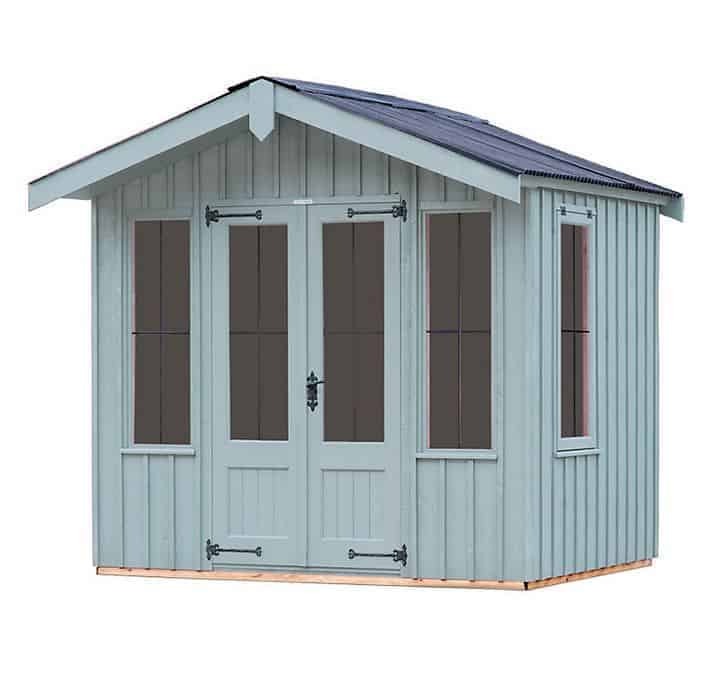 But if you are going all out and want to make sure that the summerhouse you buy will be the only one you ever need then this summerhouse looks great, but it will also stay looking great for many, many years. If you have the money then we are sure, you would be very happy with the Ickworth Summerhouse.